Photo: Joseph L. DeYarmon House, ca. 1878, Routes 179 and 464, Lakeville, OH. Listed on the National Register of Historic Places in 1982. Photographed by User:Chris Light (own work), 2010, [cc-by-3.0 (creativecommons.org/licenses/by/3.0)], via Wikimedia Commons, accessed June, 2014. 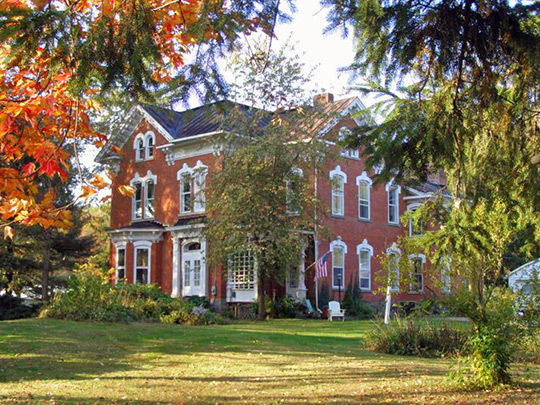 The Holmes County Courthouse is located at 1 East Jackson Street, Millersburg, OH 44654; phone: 330-674-1876. Established in 1824, Holmes County was predominantly agricultural throughout the 19th century. The 1880 census revealed over 95% of its 267,000 acres as part of active farms. Railroads in the county developed rather late and industry never really developed in the 19th century. Around the turn of the century a large oil boom interrupted the county's agricultural orientation. Steven McQuillan and David A. Simmons, Ohio Historic Preservation office, Historic and Architectural Resources of Holmes County, OH, nomination document, 1981 & 1984, National Park Service, National Register of Historic Places, Washington, D.C.